The world's first moving building, an 80-storey tower with revolving floors giving a shifting shape, will be built in Dubai, its architect says. 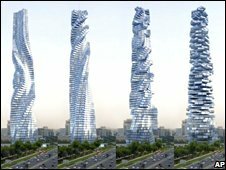 The Dynamic Tower design is made up of 80 pre-fabricated apartments which will spin independently of one another. "It's the first building that rotates, moves, and changes shape," said architect David Fisher, who is Italian, at a news conference in New York. "This building never looks the same, not once in a lifetime," he added. 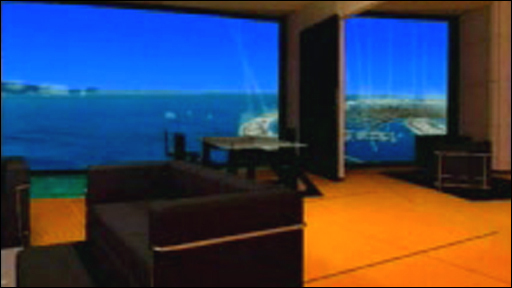 The 420-metre (1,378-foot) building's apartments would spin a full 360 degrees, at voice command, around a central column by means of 79 giant power-generating wind turbines located between each floor. The slender building would be energy self-sufficient as the turbines would produce enough electricity to power the entire building and even feed extra power back into the grid, said the Italian architect at the unveiling of the project in New York. The apartments, which will take between one and three hours to make a complete rotation, will cost from $3.7m to $36m. There are also plans to build a similar, 70-storey skyscraper in Moscow. "I call these buildings designed by time, shaped by life," said the Florence-based architect, who has never built a sky-scraper before. "These buildings will open our vision all around, to a new life." The skyscraper will cost an estimated $700m to build and should be up and running in Dubai in 2010.